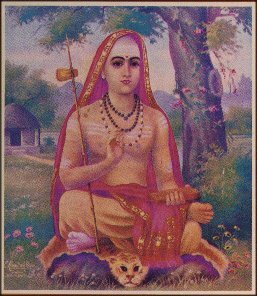 The Advaita Vedanta Anusandhana Kendra (Advaita Vedanta Research Center) is dedicated to increasing knowledge of the tenets of Advaita Vedanta--a philosophy and religion based on the Vedas that teaches the non-duality of the individual soul and God--as expressed by its foremost exponent Shankaracharya (whose picture you see above) and the unbroken succession of teachers descended from him. Sanskrit texts belonging to the Advaita Vedantic tradition. Collection of pages on some previous discussion on the advaita-l list for easy review. Articles about various aspects of Advaita Vedanta. Links to other web sites dealing with Advaita Vedanta. Subscribe, unsubscribe, or search the advaita-l list here.